Hello beautiful readers! I am in a super happy mood right now. I haven't been posting much because I've been busy preparing for a couple of job interviews I had. I'm that type of person who gets super anxious if I feel under prepared. But anyways, most of them went way better than I would ever expect. I always underestimate myself, I don't know why, but I do. Anyways, past couples of days my nails have been super simple. No nail art or anything. Since I feel like I haven't posted in ages, I decided create something new. This theme is inspired by Just Cavalli Resort 2013 line. I really love the bold mix of colors and patterns in the entire collection, so you should definitely check it out. There are a lot of different elements in this nail design. A little half moon, a little french tip, and add in some leopard print. If you want to try this design out but feel the patterns are a little too busy for you, feel free to modify! Speaking of which, two weeks ago, I stumbled on someone's interpretation of my second attempt at a Tiffany's inspired design (on Instagram out of all places). It's actually pretty cool to see that! If you interpret one of my nail designs, please show me because I would love to see it. Generally, I just like try to replicate the fashion print as close as possible and turn it to a workable manicure. If you want to know how to do this? Keep reading! 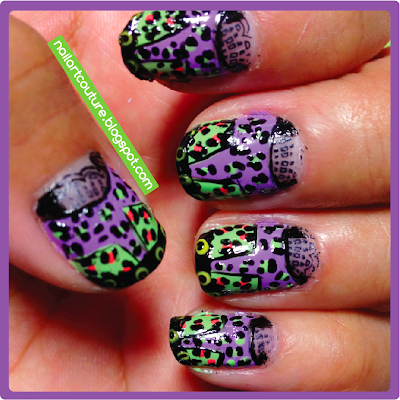 Using the M71 plate, transfer the lace image to the bottom of your nail. Using a Q-tip and nail polish remover, shape the image into a half moon. Next use a nail art brush to fill in the sides and outline the half-moon shape. Using a nail art brush and purple polish, create a horizontal band on top of the half-moon. Then create a long triangle at the top of your nail. Fill in the unpainted area with a green polish. Next using a dotter, use green polish and dot the purple area. Use a bright orange polish to dot the green area. Using either a very fine tip dotter or a tooth pick, create black leopard prints around the dots that you created. Use black polish and create a fine French nail tip. Once it has dried, use a yellow polish and dot about 3 or 4 evenly spaced dots. Within the yellow dots, place in a smaller black dot, this is to replicate the belt. Finally use a fine black nail art brush and outline the green area and do any final touch ups. Anyways I hope you enjoyed this nail art. Feel free to like it, share it, pin it! I am always looking for a challenge, so be sure to drop by my READER'S REQUEST section to submit a request! Whoa! The detail is amazing as always! That looks amazing! Such a good job. I've been searching for fellow Canadian bloggers all afternoon(at work) and just came across yours as I was getting to leave for the weekend. So happy I stopped to read. Looking forward to following you and seeing your gorgeous designs!